Health justice is more than a concept. Health justice should be the very foundation of planning our communities, to help all residents live a healthy life free of chronic diseases like heart disease and high blood pressure. Health justice ensures that everyone, no matter your zip-code, has access to safe and clean neighborhoods, safe physical activity spaces, quality and affordable food, mental health resources, quality healthcare and quality education. When health justice is reached, the healthy choice will be the easy choice for everyone to make. 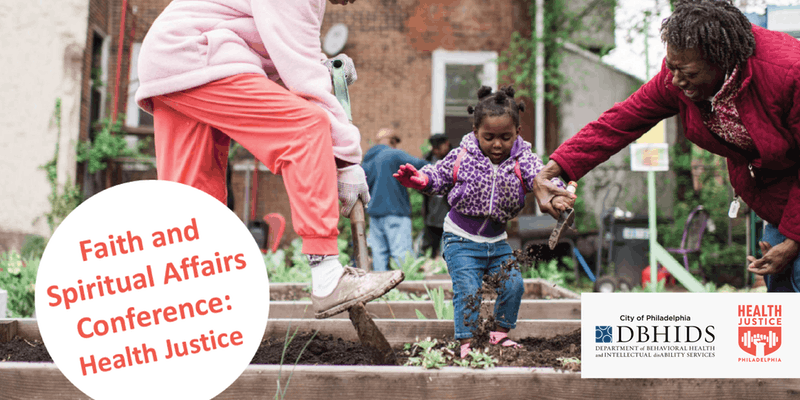 Come to the 2019 Faith and Spiritual Affairs/ Health Justice Conference on Friday, April 26, 2019 at the Pennsylvania Convention Center from 8:00am – 4:00pm! Join us as we bring together community change agents, the creators of the Health Justice Summit and the Faith and Spiritual Affairs Advisory Board to build a coalition and movement for health justice in Philadelphia. The conference provides a unique opportunity for spiritual and religious leaders, community members, community and civic organizations, city agencies, among others to highlight and discuss the intersections of mental, physical, spiritual and community health. Learn from a variety of experts about topics that include the current state of black men’s health, healing trauma with faith, self-care 101, black mental health, confidence in culture, returning citizens, yoga and physical activity, among other amazing topics. This informative conference will leave you energized through joyful movement, as well as, creatively thinking about ways you can engage and address health justice in your community. Dress comfortably for movement throughout the day. We look forward to seeing you at this year’s conference! The event is co-hosted by the Philadelphia Department of Behavioral Health and Intellectual Disability Services and the Philadelphia Department of Public Health. Register at https://fsahj.eventbrite.com or just show up and register on the day of the event. Want to know more about last year’s Health Justice Summit and how to get involved in more Health Justice work? Click here.